F.A. Cup 1st Qualifying Round. Saturday 2 September 2017, 12:30pm. This Saturday Billericay Town welcome Didcot Town to AGP Arena for the first ever meeting between the two sides. The kick-off time has been brought forward to 12:30pm. The Gunner’s staff, players and fans will have a journey of roughly 95 miles from Oxfordshire to Billericay, taking around two hours. Didcot are members of the Southern League West Division and have made a strong start to the season. Like The Blues they lost their opening fixture but have had a winning run since then. They lost away to Bideford but have beaten Wimborne Town, Cirencester Town and Kidlington. These results have left Didcot sitting in third position as they push for promotion. This will be Didcot’s second match in this season’s FA Cup. In the Preliminary Round they won 2-1 at Hellenic League Flackwell Heath. Billericay Town will be under no illusions about the toughness of this weekend’s opponents. This match will be shown live on the BBC Sport website. A match from every round of the tournament will be broadcast on one of the BBC’s digital platforms. 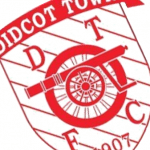 Didcot Town were formed in 1907 and competed in local leagues until 1953 when they became founder members of the Hellenic League, becoming the inaugural league champions. They left the Hellenic for six years but rejoined for the 1963-64 season. They would remain members until they won the title again in 2006 and then became members of the Southern League. The Diddy’s best F.A. Cup run took place during the 2015-16 season when they reached the First Round Proper. They beat VCD Athletic and Brentwood Town on the way before drawing Exeter City at home. A crowd of 2,707 filled their Loop Meadow Stadium as Exeter City won 3-0. Like Billericay Didcot have tasted success in the F.A. Vase. In the 2004-05 tournament they beat Bury Town and Jarrow Roofing to reach the final, which was held at White Hart Lane. In the final they beat AFC Sudbury 3-2. For Didcot fans travelling to the match the journey will take almost as long by car as it will by rail. Didcot are running a coach from their home ground, leaving at 8:45pm. Any Didcot fans wishing to avail themselves of this offer will need to contact their club. Those leaving from Didcot Parkway will need to go in to London Paddington and then head to London Liverpool Street. The trains to Southend Victoria (via Billericay) usually leave from the higher platform numbers. Fans travelling by car may want to take the M40 to the M25. Once on the M25 it will take around an hour to get round to junction 28 at Brentwood. From here you will be about 15 minutes away from the ground. Rob Davies has joined Concord Rangers on an initial months loan. For those driving to the match there is secure parking available for £5.00, or there is very limited street parking along Tye Common Road. Road surfacing may restrict parking. The gates will be open from 10am. Billericay Town’s cheerleaders will make their cup debut before kick-off.